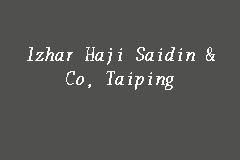 IZHAR HAJI SAIDIN & CO is a law firm located in Perak, Malaysia. The firm was founded by Tuan Haji Che Izhar bin Haji Che Saidin in year 1975, with our main head quarters located in Ipoh and a branch located in Taiping. Currently there are three lawyers in the firm, Tuan Haji Che Izhar bin Haji Che Saidin and Encik Esmael Shah Bin Shahruddin are based in our Ipoh office and Mr. Lim Meng Huat is the residential lawyer at our Taiping branch office. Our firm also has 10 experienced staff in our Ipoh office and a work force of 7 experienced staff in the Taiping office. IZHAR HAJI SAIDIN & CO is insured against professional negligence in the sum of RM 10,000,000.00. It’s our pride that our firm has never had any claims under the Professional Indemnity Insurance Policy. Kes bernombor AA-24FC-589-08/2016 adalah tentang RHB BANK BERHAD ( IZHAR HAJI SAIDIN & CO. ) melawan MUHAMAD RIDZUAN BIN MOMAMAD RAWI ( *Not Appointed ).Kes ini dihadapi di mahkamah tinggi sivil ipoh. IZHAR HAJI SAIDIN & CO. did AA-24FC-730-09/2016 case number, RHB BANK BERHAD against LEE KEE FOONG at the mahkamah tinggi sivil ipoh.